We’ve featured Devon in South West England several times before, but thought we’d concentrate on one of the reasons for the county’s popularity with visitors: its many lovely villages. Dittisham /ˈdɪtsəm/ is a village and civil parish in the South Hams district of the English county of Devon. It is situated on the banks of the tidal River Dart, some 2 miles (3.2 km) upstream of Dartmouth. Cockington is a village in Torquay in the English county of Devon. It has old cottages within its boundaries, and is about a half a mile away from Torquay. The village was probably founded 2,500 years ago during the Iron Age with evidence of two hill forts on either side of Cockington valley. Lustleigh is a small village and civil parish nestled in the Wrey Valley, inside the Dartmoor National Park in Devon, England. It is between the towns of Bovey Tracey and Moretonhampstead. The village is focused around the parish church of St John the Baptist. Combe Martin Bay has a shingle and sand beach when the tide is high, but at low tide there is a lovely sandy beach with lots of rockpools to investigate. You can hire kayaks to paddle around the sheltered bay with a chance of meeting our friendly dolphins. Located in an Area of Outstanding Natural Beauty, Bigbury on Sea beach in South Devon is ideal for family holidays. Dusted with sand and lapped by shallow waters, the beach offers safe fun for groups particularly if you’ve got children in tow. Welcome to a different world! Clovelly is a unique village once owned by the Queen of England and from Elizabethan days until today, it has been in private ownership, which has helped preserve its original atmosphere. The picture-postcard village of Beer, Devon nestles in Lyme Bay, on the 95-mile long Jurassic Coast, England’s first natural World Heritage Site and forms part of the South West Coastal Path. Historic fishing village with winding narrow streets and colourful houses. A calm cliff-top village with spectacular views less than a mile from Woolacombe, Mortehoe is listed in the Doomsday Book and has a number of interesting features including a rare barrel-roofed thirteenth-century church. Croyde is a village on the west-facing coastline of North Devon, England. The village lies on the South West Coast Path near to Baggy Point, which is owned by the National Trust. It lies within the North Devon Coast Area of Outstanding Natural Beauty. The beautiful coastal town of Salcombe sits on the banks of the Salcombe Estuary making it one of the prettiest towns in South Devon. If you love the hustle and bustle of a traditional English market town, you’ll love the South Devon estuary town of Kingsbridge. Braunton is an English village, civil parish, ecclesiastical parish and former manor in North Devon. The village is situated 5 miles (8 km) west of Barnstaple. While not the largest village in England, it is amongst the most populous in Devon with a population at the 2011 census of 7,353 people. The Devon village of Branscombe is found on the South coast of Devon between Seaton and Sidmouth and is one of the most relaxing and picturesque villages on Jurassic Coastline. Sampford Courtenay is a village and civil parish in West Devon in England, most famous for being the place where the Western Rebellion, otherwise known as the Prayerbook rebellion, first started, and where the rebels made their final stand. It has a population of 509. View of the war memorial and old post office in the centre of Huntsham, Devon. 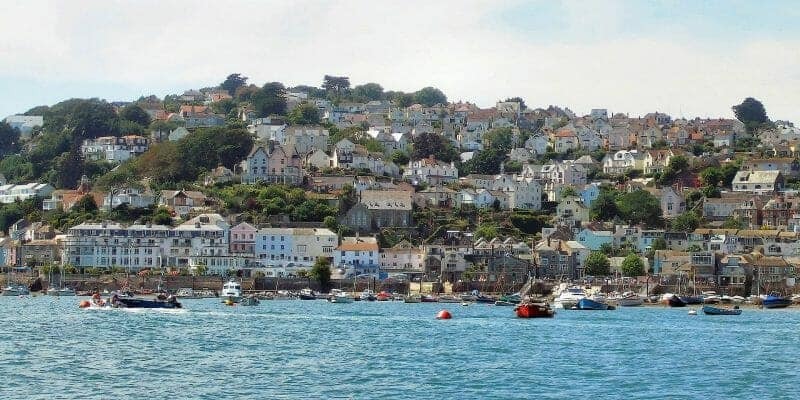 Brixham /ˈbrɪksəm/ is a small fishing town and civil parish in the district of Torbay in the county of Devon, in the south-west of England. Brixham is at the southern end of Torbay, across the bay (Tor Bay) from Torquay, and fishing and tourism are the major industries. Washford Pyne is a village and civil parish in Devon, England. It is 7 miles NE of Morchard Road railway station and 8 N by W of Crediton. The local church is dedicated to Saint Peter and the base of the tower dates from the 15th century with the rest of the church rebuilt in 1882. Stockleigh Pomeroy is a village and civil parish in Devon, England at the foot of the Raddon Hills. The parish church which is dedicated to St Mary the Virgin has a Norman doorway. In 2016, a new village hall was opened to replace the Nissen hut used formerly which was opened in 1950. Exebridge is a village that lies on the border between Devon and Somerset, England. It lies at the confluence of the Barle and Exe rivers. Exebridge is named so because of the bridge over the River Exe that also marks the border between Devon and Somerset. What’s The Prettiest City/Town In England?